A couple of birders who recently travelled to the Arkansas Big Woods are claiming that they saw an ivory-billed woodpecker during their time in the swamp. Only a few minutes passed before the two heard what Johnson said was the call and rapping of an ivory-billed. "About 80 feet in front of me, I saw something flush from the base of a tree," Johnson said. "As the bird came up, I got a real good look at it. 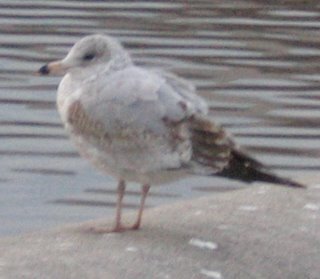 The bottom half of the top side of wing was white, and this bird had a 30-inch wingspan. "We just happened to sneak up on him and flush him," he said. "Otherwise, we would have never known he was there." Unfortunately, without further documentation, we cannot be sure that what they are reporting is accurate. But Cornell's research in the area shows that we need to take such claims more seriously than we would have just one year ago. Welcome to anyone who is visiting here for the first time via the post linked from the carnival. That is not a very exciting post, but it reflects my early and continuing interest in blog carnivals. Now for my tags... First, Stalwart Light, then Dave, Mike, Troutgrrl, and Trix. January 2006 was among the warmest on record at the local airports. The warm temperatures have been a result of a strong high pressure area in the Atlantic that directs cold fronts further north. This looks like the sort of arrangement that keeps our summers hot and sticky. 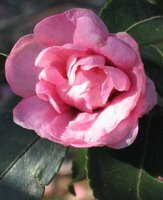 There remains some possibility of a colder-than-normal February, but in the meantime, signs of spring abound. The warm weather and lack of snow have helped birds and other creatures find food and encouraged some to come out early. Someone called the Hidden Oaks Nature Center in Annandale to report that praying mantises were hatching, and manager Michael McDonnell said he saw a pair of bats flying around last week, catching insects at night. Normally, they are hibernating at this time of year. In addition, this January has produced the least amount of snow, with only a couple of snow flurry incidents and no major storms. The National Weather Service chose yesterday to unveil a new five-category scale for measuring huge snowstorms in the Northeast, which includes Washington, that is similar to ones it uses for hurricanes and tornadoes. The rating on the Northeast Snowfall Impact Scale will be based on the size of the area and number of people affected by the storm and how much snow it drops. Categories will range from "notable" to "extreme." In between are "significant," "major" and "crippling." If current trends continue, I doubt there will be much use for that around here this winter. Virginia is expected to approve a $200 million appropriation for cleaning up the Chesapeake Bay. The money comes from a budget surplus and will go towards better sewage treatment and reducing agricultural runoff. The state government of Maryland estimates that the bay's cleanup will cost over $10 billion to complete. 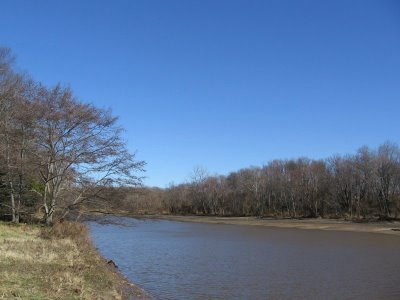 The Chesapeake Bay's tributaries in Virginia are popular with bald eagles. A survey of a 35-mile stretch of the Rappahannock River found 276 bald eagles. A slightly longer portion of the Potomac held 191 eagles. The large eagle population in these areas is attributed to the relative lack of development; the river is bordered on either side by large farms and preserves. In Minnesota, the towns of Sauk Prairie have made much in tourist money from the large gatherings of bald eagles that occur there. 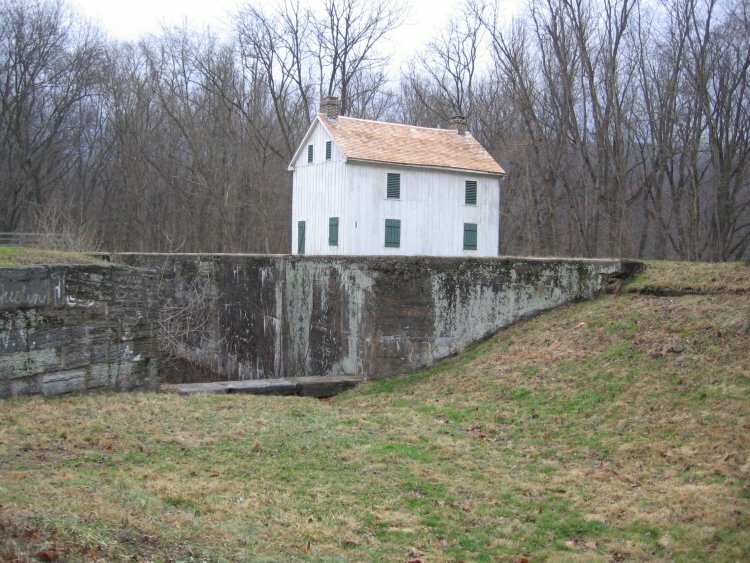 A local newspaper covered last Saturday's C&O Canal Count. In other counting news, the Big Garden Birdwatch will be held this weekend in the U.K. See the RSPB for more information. The American equivalent, the Great Backyard Bird Count, will be February 17-20. An article in the journal Nature reports that certain types of snails travelled from Europe to islands in the South Atlantic by riding on birds. See Snail's Tales for more. A snowy owl was still being seen at Dulles Airport as of yesterday evening. Scientists interviewed for the article worry about the effect of warming on ocean fisheries and Atlantic currents. Of course, charges of politically-inspired censorship in the current administration are nothing new. Expert research has consistently been suppressed to benefit the administration's image or undermine opposition to its policies. In this case the government's refusal to deal with the problem of global warming will eventually make it impossible to mitigate its consequences. We need solutions and we need them now. It appears that a snowy owl is roosting in northern Virginia. In fact, it appears to be roosting at busy Dulles Airport. I am not sure if I will have a chance to go out and see it, but I thought I would pass the word along. More information from the va-bird listserve is here, here, here, and here; with photographs here. Normally I would not post owl locations, but since this individual has been sitting out in a busy location anyway, I figure that birders would not create too much extra disturbance. If this seems repetitive, that's because it is. 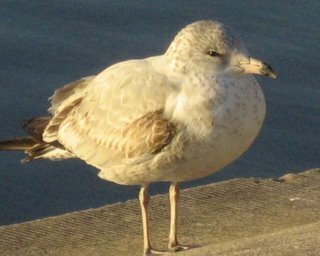 I have another edition of Friday gull blogging for you. Right now gulls are the easiest birds for me to photograph, so that is what I am producing here. I do not know if this will be a permanent feature in this space. 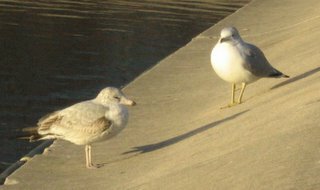 Like last week's batch, these are another group of gull photographs that I took earlier this week on the National Mall. I believe both of those were first-winter ring-billed gulls. The last photograph definitely is a first-winter bird. Visit the Friday Ark #71 for other animals. On Wednesday the Washington Post ran an story on the decline of crows in the mid-Atlantic region (thanks, Wildbird). The decline has been attributed largely to the West Nile Virus. While the virus has had little effect on human health, it has devastated crow populations, particularly among American crows. An annual survey of breeding birds, organized by the Patuxent Wildlife Research Center and dating to 1966, shows a precipitous drop in Maryland's crow population in 2004. Birders in 57 locations tracked an average of 60 in 2001. The number dropped to less than 34 two years ago. And in large roosts in Illinois and Oklahoma, three-quarters of the crow populations have dropped dead in a single year, said Kevin McGowan, a scientist at the Cornell Laboratory of Ornithology in Ithaca, N.Y. He likens the species' devastation to the human plagues of medieval Europe. In his freezer, he has the bodies of 30 crows he has known since they were nestlings, the oldest 13 years of age. Local birders have noticed a difference. Bird-watcher George Jett of Waldorf feeds crows and other wild birds. He says the once-large roost that inhabited woods near Routes 301 and 228 appears about a tenth its former size. Before the mosquito-borne virus arrived from the Middle East, he might have had 30 to 40 crows in his yard. "Now, I'm getting five or six," he said. "I hope the species learns to evolve with this. I enjoy crows." This afternoon I walked around the east end of the National Mall to see if there was anything unusual. The reflecting pool in front of the Capitol was deserted; usually there are plenty of gulls there, but not today. We did have very high winds today so perhaps they took shelter elsewhere. The National Museum of the American Indian still had the swamp sparrows I had noted earlier, plus a song sparrow. The usual mallard contingent was there as well. Among the mallards there was one unusual-looking bird. The photo is below. 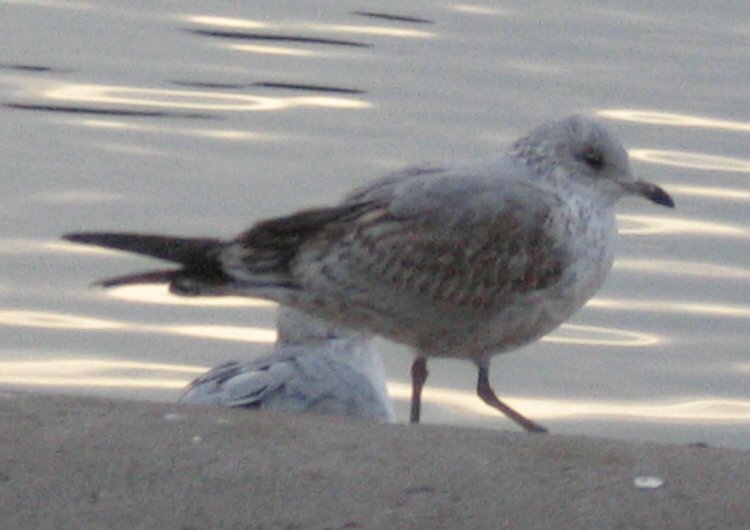 The head is mostly grayish-brown, but with a green stripe curling from the back through the eye area. 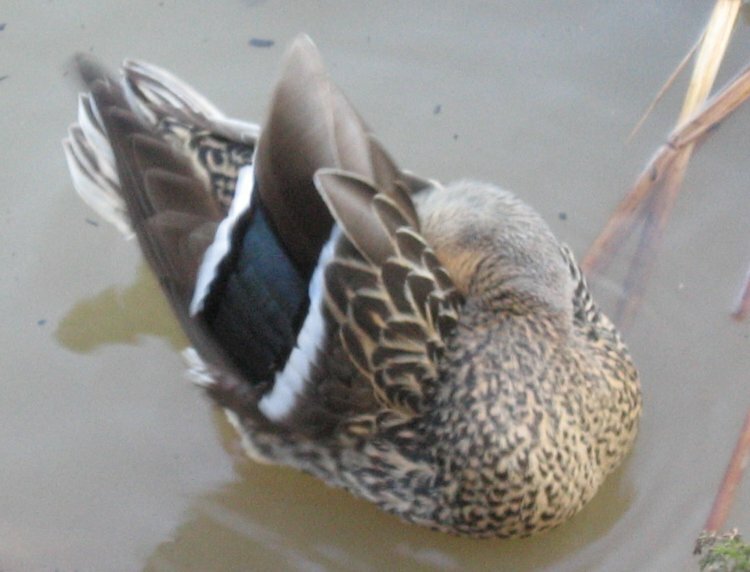 The back and sides are darker than one would expect from a mallard, but the breast is more finely streaked than a black duck, with a richer coloration. 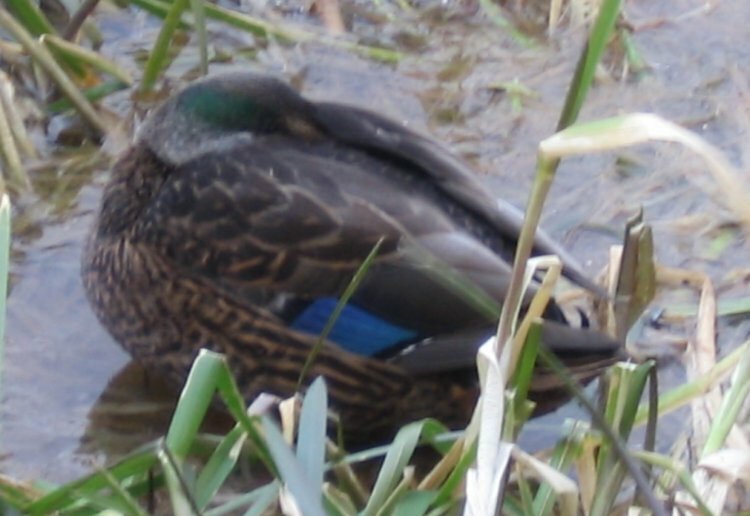 The wing patches (specula) are a bluer color than the surrounding mallards, but still have a noticeable white edging. So what is this bird? 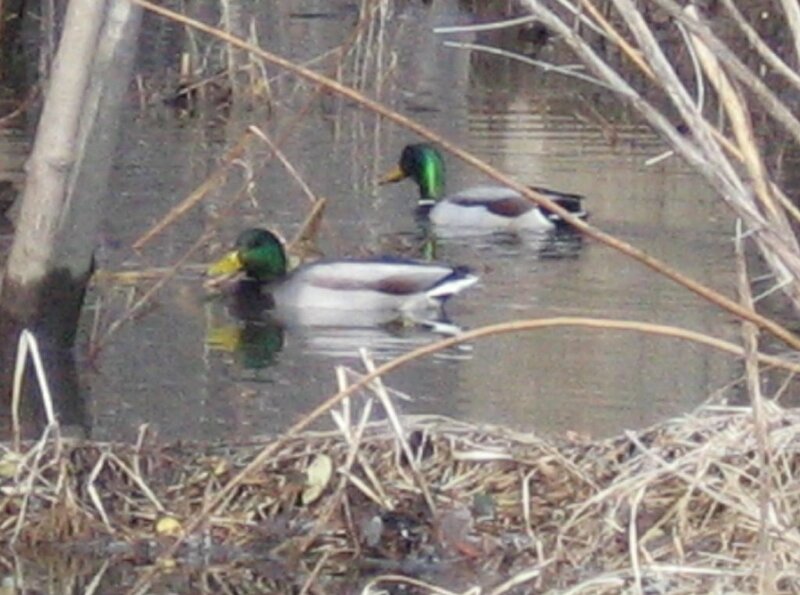 My guess is that it is a hybrid, probably mallard X black duck. Such a combination is quite common around here. 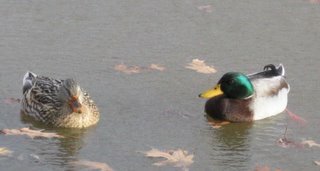 In fact, I was seeing mallard X black duck hybrids in D.C. several months before I saw an actual black duck, during my first year of birding here. Birders need to be aware of possible hybrid individuals and stay on the lookout for them. Some hybrids are given names, such as the Lawrence's and Brewster's crosses of the blue-winged and golden-winged warblers. Hybrids can and do show up anywhere one of their constituent species can be. 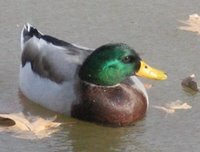 When the two species are relatively easy to distinguish, like the mallard and black duck, hybrids should not add too much extra complexity into the equation. In other cases, the presence of hybrids would make positive identification much more difficult. 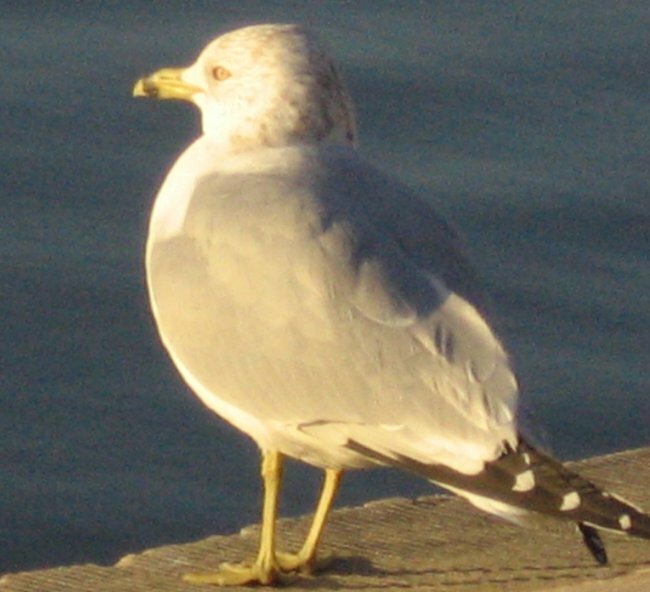 Hybridization among gulls of the herring gull complex creates special problems, because gulls are not that easy to distinguish to begin with. The above picture was taken at the National Arboretum on Sunday. 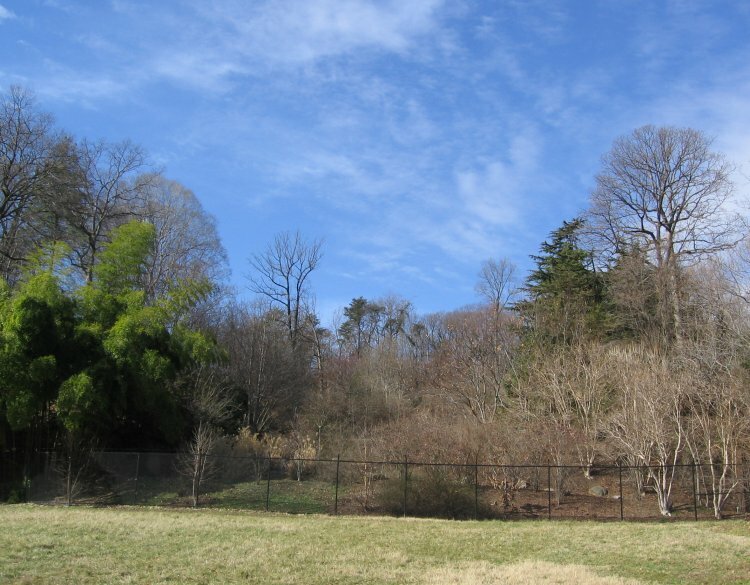 I was standing on the bank of the Anacostia River and facing towards the Asian Gardens. I wanted to express what a gorgeous day it was. On the left is a stand of bamboo trees that stay green all year. If you look carefully, you can see the security/deer fence in front. This is not exactly a birding post, so I will add in the birds seen on Sunday. My sister spotted the bald eagles. Unfortunately they were too high up to catch a photo of them like the one here. They were so high that they blended into the sky at times. The woods behind the state tree grove continues to be very birdy. The San Diego Audubon Society is holding its 6th annual America's Birdiest City and Birdiest County contests during the peak migration period in April and May. Birders in participating cities and counties attempt to find as many bird species as possible during a 72-hour period. Bill of the Birds has the information. Several state and federal agencies have agreed to maintain over 25,000 acres near Washington, DC, as wild areas. 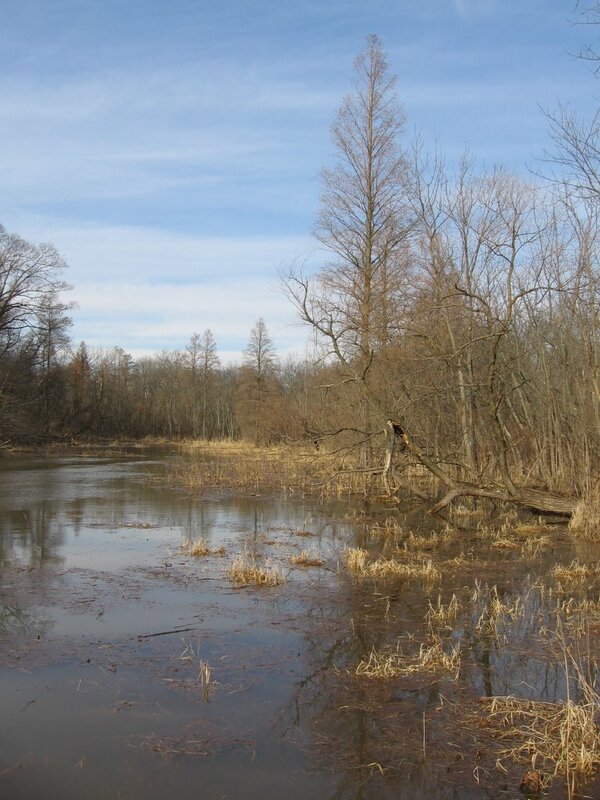 This land includes the Patuxent Research Refuge, as well as several nearby tracts. A survey of brown bullhead catfish in Maryland's South River shows that they have abnormally high skin and liver cancer rates. Within the Chesapeake watershed, only catfish from the Anacostia River showed higher liver cancer rates. Catfish are significant indicators of the overall health of a watershed; such high cancer rates are likely the result of excessive pollution. U.S. Fish and Wildlife officials have not yet discovered the exact cause. Here's a short review of the latest edition of National Geographic's Complete Birds of North America. On Saturday, birders fanned out along the length of the 184.5-mile C&O Canal to count birds. The C&O Canal mid-winter bird count is sponsored annually by the DC Audubon Society. This is the eighth year that this count has occurred. In that time, coverage of the canal has increased from 138 miles in 1999 to a record 181.5 miles in 2005. It will be interesting to see how many miles were covered this year as one previous coordinator has died and another left the executive board, leaving the count's leadership somewhat in flux. The extent of the coverage for 2006 will not be known until all reports have been submitted and tallied. The full results will be posted on DC Audubon's canal count webpage later in the spring. I was assigned to miles 134-137, along with another DCAS board member (who was the lead counter for this section) and my sister. On the drive to the site, we passed through some beautiful landscapes, especially once we got off the interstates and onto local roads. Where there is not forest, the land is covered by northern-type forests of mixed oak, hickory, and pine trees. The land here is very hilly, and the ridges of the Appalachians were visible in the distance. 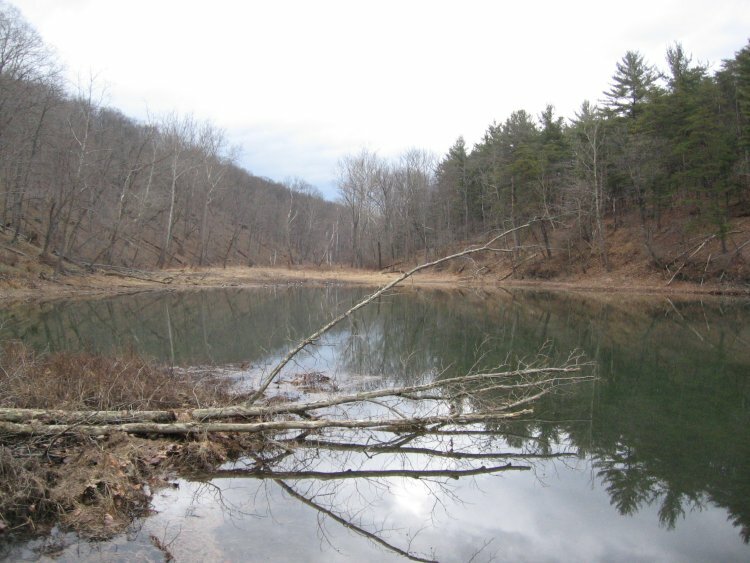 The photo above shows a lake near the start of mile 134 that illustrates a typical scene from this area. The species diversity for this stretch was not very high; we only found 26 species. (The full list is below.) I think our tally would have been higher had we been covering areas in Washington, DC, or Montgomery County, MD. However, it was still a fun walk. I saw one new species for my Maryland life list, the black-capped chickadee. 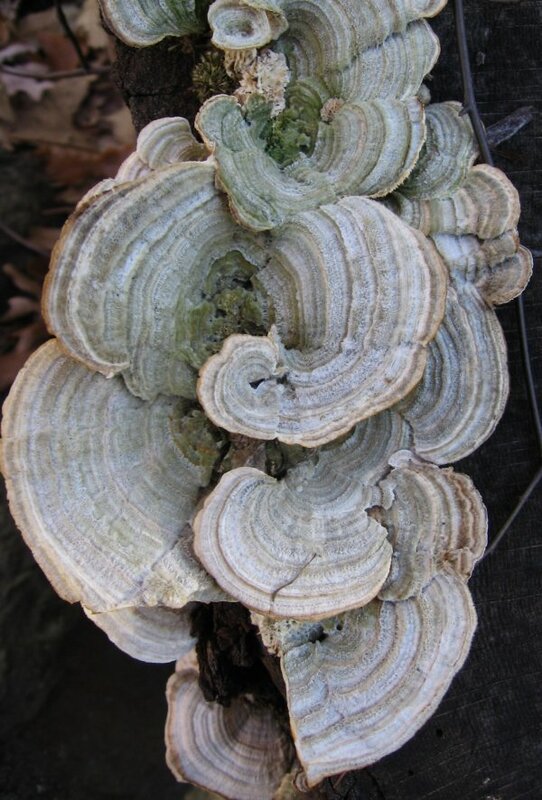 While this species is ubiquitous farther north, in Maryland it is rare outside the western mountainous counties. Pileated woodpeckers, one of the more spectacular woodpeckers in this area, could be heard up and down the length of the two miles, even though we only saw one. Eastern bluebirds, brown creepers, a yellow-bellied sapsucker, and a winter wren were among the other avian highlights of this segment. 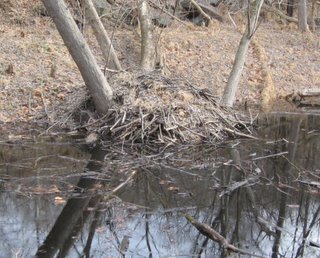 In addition to bird life, we found evidence for the presence of other animals; one example is the beaver house shown below. The scnery, though, was the best part of counting along this segment of the canal. 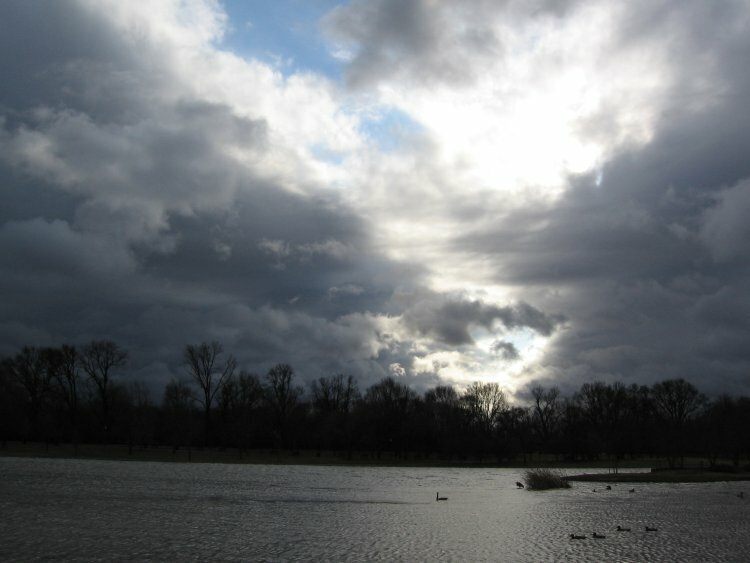 For much of the day, the sky was overcast, with occasional light rain showers. At one point the sun broke through the clouds and reflected off the water of the Potomac River. An attempt to capture this beautiful moment is shown below. For other reports from the C&O Canal Count posted on MDOsprey, see here, here, here, here, and here. Reports from the Baltimore Bird Club's mid-winter count here and here. Prince Georges County mid-winter count results. A listing of mid-winter bird counts in Maryland. Historical data from the Harford County mid-winter bird counts. 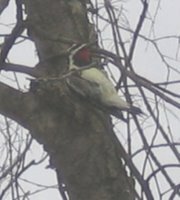 Results of the East Brunswick, NJ, mid-winter bird count. 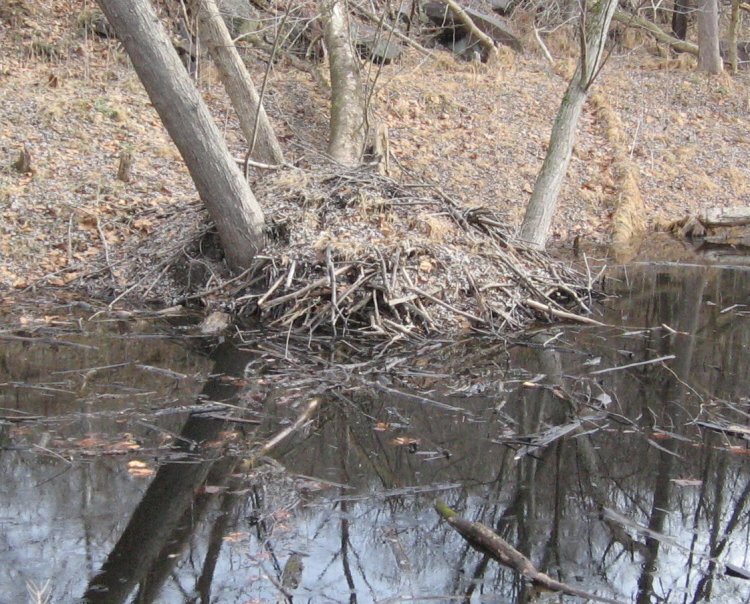 An article on the Philadelphia mid-winter bird census from 2005. 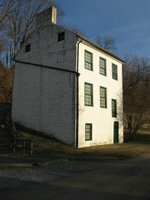 My earlier post on the C&O Canal Count. Common birds, even the "dirty" ones that crowd the plazas of urban areas, can be quite beautiful when seen in the right light. 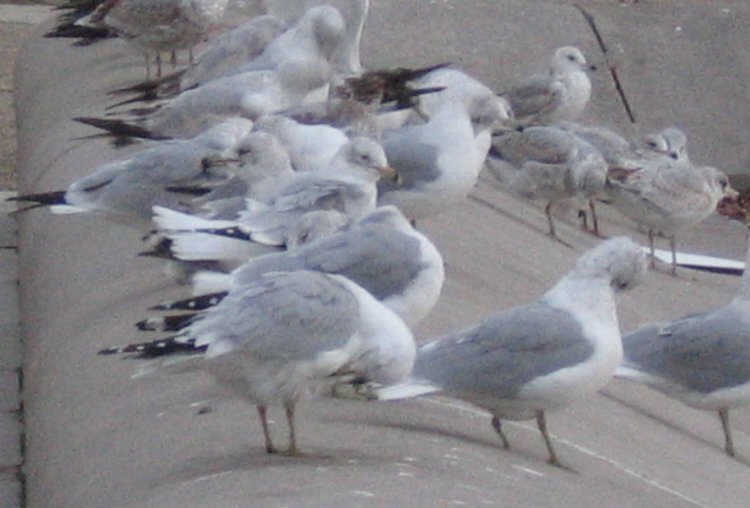 Here are some ring-billed gulls - one of the most common species in Washington - that I photographed recently. 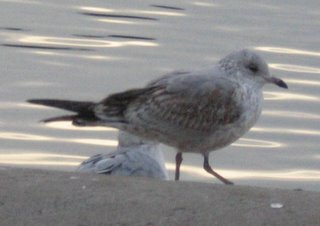 Adult and first-winter gulls bask in the late-afternoon sun. An adult inspects the photographer. In basic (winter) plumage, adult gulls have very finely-streaked heads. An adult in winter plumage. Visit the Friday Ark #70 for the rest of the animals. Lee Budar-Danoff, 39, has had to wash her silver Honda four times in the past week because the voluminous vulture excrement deposited on the windshield made it difficult to see. Nearby roofs are stained with green-and-white splotches of feces. And the birds terrify some youngsters. "I want them to fly away right now!" said her 3-year-old daughter, Noelani. "They're not my friends." Budar-Danoff, who is also a board member, said she knows vultures mostly scavenge for carrion along nearby Route 175, but a part of her still worries that the birds might somehow end up hunting live prey. "If their food supply goes away, what are they going to turn to?" she said, glancing down at Bear, her excitable Lhasa apso. "Small dogs and cats could be at risk." Wildlife experts, though, said vultures almost never eat live animals. While some residents worry about the vultures eating live animals, that really should not be a concern. Vultures are not equipped with the powerful talons that allow hawks to kill; rather, vultures are specially adapted to scavenge. And there is certainly plenty of material for scavenging. Our suburbs are already overpopulated with deer, plus the population of squirrels, raccons, opussoms, and other birds gives the vultures plenty of material to eat, whether they die naturally or in car accidents. So there is little to worry about on that score. That still leaves the inconvenient aspects of the vulture roosts. Unfortunately there likely is little that will actually work to solve this problem. If the example of Canada goose control gives any indication, harrassment like that suggested in the article would just make the vultures move somewhere else, where they would become as much of a nuisance. The Canada goose is actually a good parallel because it is another case in which the spread of human developments has created a situation in which the "pest" population can also expand. The geese have taken advantage of the creation of large grassy areas and artificial ponds in public parks and industrial parks. Meanwhile the vultures have preyed on the many carcasses created by our highways and the surplus of living animals that have few predators. At the same time humans have taken more and more of possible nesting and roosting territory away from these birds. So it is no wonder that humans and birds keep rubbing elbows, and it should be no surprise if this situation continues, and in fact continues to increase. The fifteenth I and the Bird is here! Go to SNAIL'S TALES to read interesting posts from bird bloggers around the country and around the world. This week's issue is in verse but is quite terse. Welcome to anyone who might be visiting here for the first time as a result of the carnival. I hope you like what you find; please take a look around. Birds Korea is running a fundraiser in an effort to save the Saemangeum flats, a vital staging area for migratory shorebirds in Asia, from a reclamation project. Many endangered and threatened species pass through this area on migration, including some like the spoon-billed sandpiper that occasionally show up in North America. For details see Charlie's Bird Blog. A rufous hummingbird was banded in Virginia this week. Pictures are available of the hummingbird and parts of the banding process. Another rufous hummingbird has been visiting a feeder in Fayetteville, North Carolina. For further information about wintering hummingbirds, see Trochilids.com. A cheating girlfriend was betrayed by her boyfriend's African grey parrot, who kept repeating her lover's name whenever she answered the phone. As always, watch what you say around parrots. me chuckle for days. Shhhhh... better not tell Tom Nelson. Four other bird bloggers have set up year lists on their blogs. Charlie Moores's list for 2006 has already passed my life list, in just two weeks! Mike has set up a new page to track his year list online as well. Meanwhile, Katie dedicated a new humbly-named blog to her year list, while Tom McKinney has a blog for his "2006 birding journal." I walked over to the National Museum of the American Indian this afternoon to check out what birds were hanging around there. On the way I stopped by the Capitol's reflecting pool. 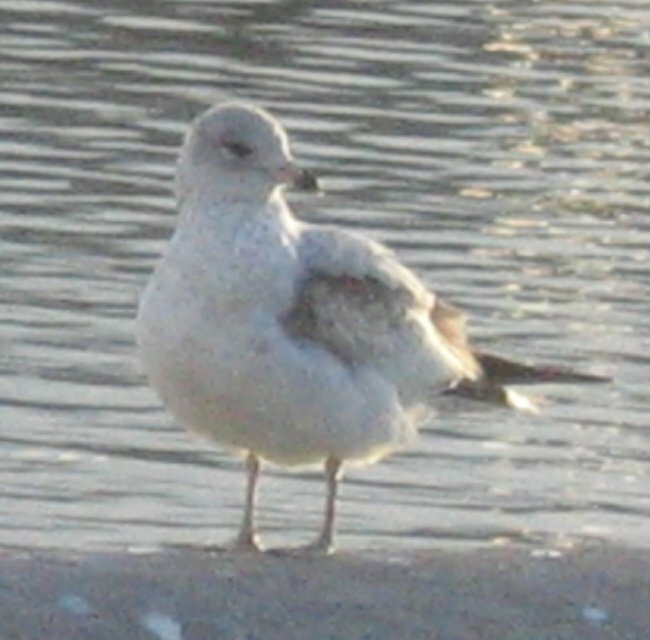 Lots of ring-billed gulls were in and around the pool. 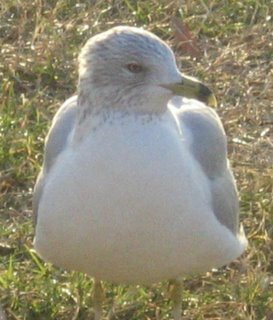 The flock included this finely-streaked first-winter ring-billed gull. The folks running the Indian museum, as I have noted here before, planned several habitats into a series of gardens surrounding the museum. So far, the most interesting to me - and to birds - has been the freshwater marsh. The marsh pond has become a gathering place for ducks and other birds. The mallard flock has grown to about 15-20 birds, which is fairly large for a pond of this size. One has the opportunity to watch them at close range, since they are used to people. Above: Apparently this hen mallard was camera-shy. Today the marsh also held a small flock of red-winged blackbirds. Several sparrows were represented as well, including house sparrows and swamp sparrows. A few of these are pictured below. Shortly before I left the museum grounds, a large flock of mourning doves (about 40) flew in, alighted briefly on the trees, and then took off headed south across Independence Avenue. This was not a real surprise since I have seen mourning doves in large numbers around the Mall before. 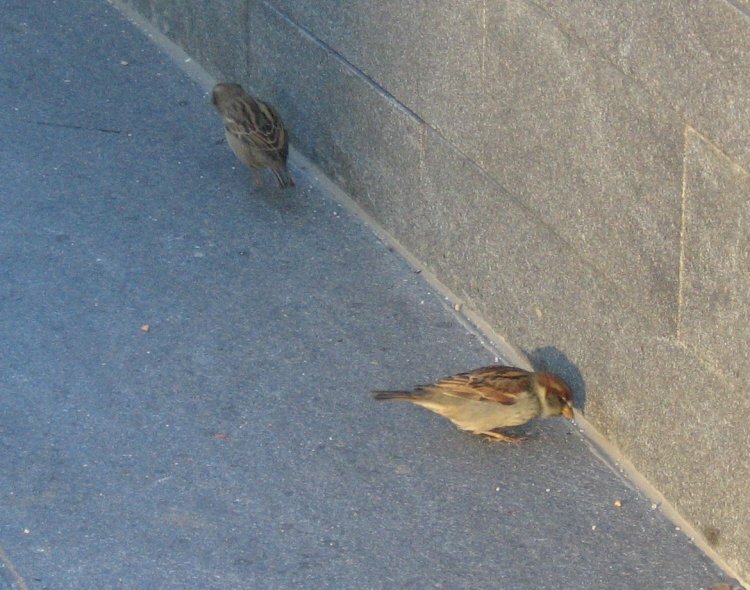 Above: House sparrows feeding along the wall. Swamp sparrows above and below. This morning I birded at the National Arboretum. Like yesterday , today was extremely blustery but with even lower temperatures. The wind kept most of the birds down low in the brush, so the only real areas of activity where birds could be seen were inside of woods or on the lee side of hills. The main difference was that the sky was blue and cloudless. I combed the Asian gardens carefully for any warblers that might have dropped in. 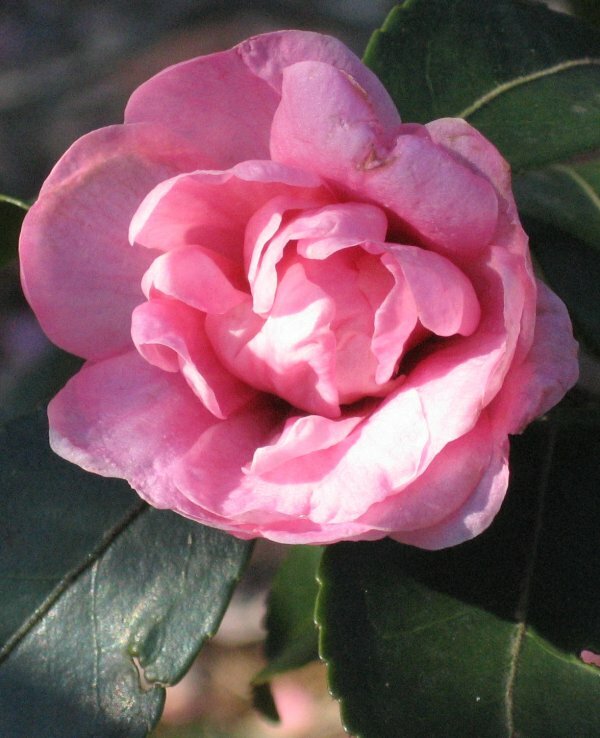 Occasionally one will winter here and take advantage of the flowering bushes of the tea family that dot the hillside. No warblers were there, but I did find a hermit thrush. As I worked my way down the path to the river, a falcon - probably, but not certainly, a peregrine - darted overhead and disappeared behind the treeline. At that point I heard a red-tailed hawk's scream and a pileated woodpecker's call in short succession. The pileated flew overhead one way and then back the other way, while two red-tails wheeled above the river. Neither of these species was apparent when I got to the riverbank. (The Anacostia, by the way, seemed abnormally low this morning.) I noticed two large dark birds circle low and land in a tree by the bank - bald eagles! These were adults with fully white heads and tails. 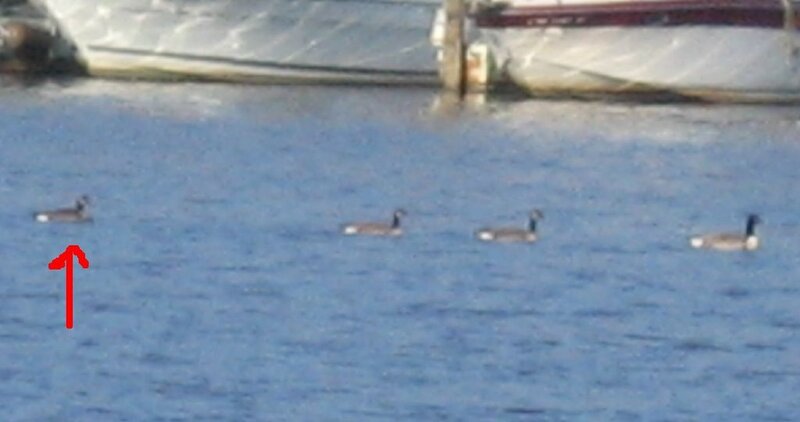 Also in the river were a pair of hooded mergansers and a pied-billed grebe. 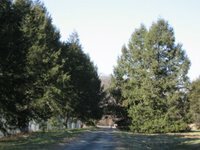 With the wind as strong as it was, I felt my remaining time would be better spent in fern valley - a low-lying wooded area rather than some other spots I normally visit. The birds there were a common mix of chickadees, titmice and cardinals, with a few golden-crowned kinglets mixed in. 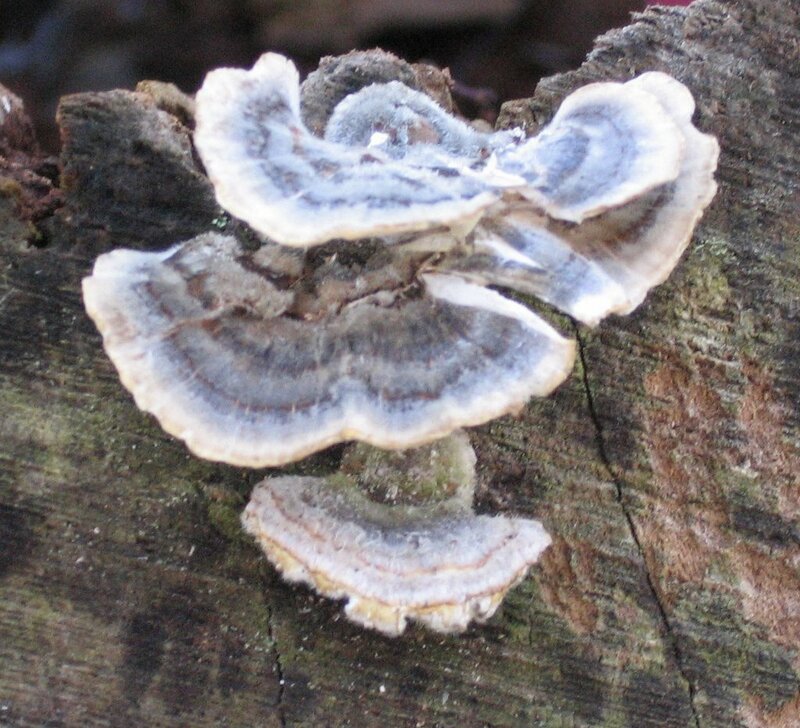 One stump along the path was overgrown with finely-detailed fungi. One example is given below. An emergency petition to have the red knot listed as an endangered species has been denied, but the USFWS is still reviewing the bird's status under its normal protocol. Officials and scientists in New Jersey worry that this shorebird could disappear from the state's beaches within a few years if more radical action is not taken. Jeff Reiter narrates a recent experience with car birding in search of lapland longspurs and snow buntings. The USDA's maps of plant hardiness ranges provide yet another indication that the earth is warming. Plant ranges have moved significantly northward over the past fourteen years. See Creek Running North (with maps) and Science and Sarcasm for additional commentary. The Philly Inquirer reports on the 20th Mid-Winter Bird Census, run by the Delaware Valley Ornithological Club. Check out the current Friday Ark. Many popular blogs have migrated to a new server, scienceblogs.com, including two in my sidebar: Pharyngula and Living the Scientific Life. I am experimenting with an offline blogging program called Qumana. This has some advantages over the Blogger interface, especially the ability to compose longer posts without having to worry about Blogger losing them or timing out. Unfortunately, because of Blogger's limitations, I still cannot upload images with that program and need to do it through Blogger's web interface. This post, meanwhile, was composed with Performancing, which I prefer for linkage posts like this one. Meanwhile, Thunderbird 1.5 was just released. Thunderbird is the open source alternative to Outlook and Outlook Express as a stand-alone desktop email client. This blog will soon have a revised template. Nothing really big is in the works, but there are some changes I have been wanting to make. 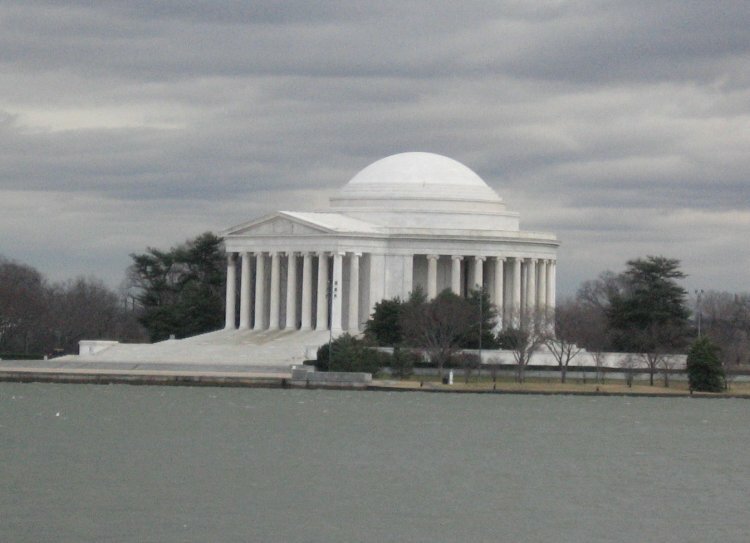 I started out by walking around part of the Tidal Basin. Only gulls were in the water. Some holly trees near the FDR memorial contained a large flock of American robins. There were accompanied by a smaller group of cedar waxwings . Some hardy waxwings braved the wind to perch out on the bare cherry trees, but even these had to retire to the relative comfort of the hollies. The Potomac also had very few birds. One flock of lesser scaup rode the waves about halfway down towards the Memorial Bridge, but that was all. One bufflehead passed overhead as I walked on. It landing in the river could hardly be described as graceful since the wind knocked it down as it circled for a landing. 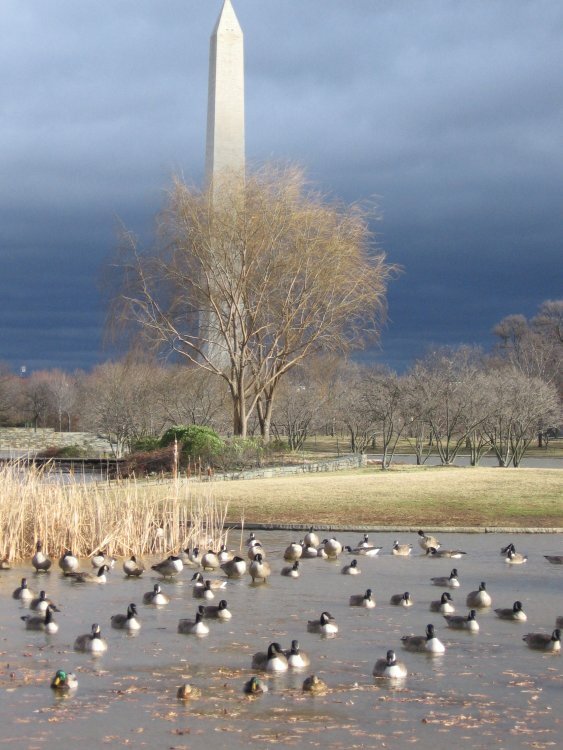 Likewise, Constitution Gardens had few smaller birds visible. However, there was a large flock of Canada geese and mallards around the island in the middle of the pond. 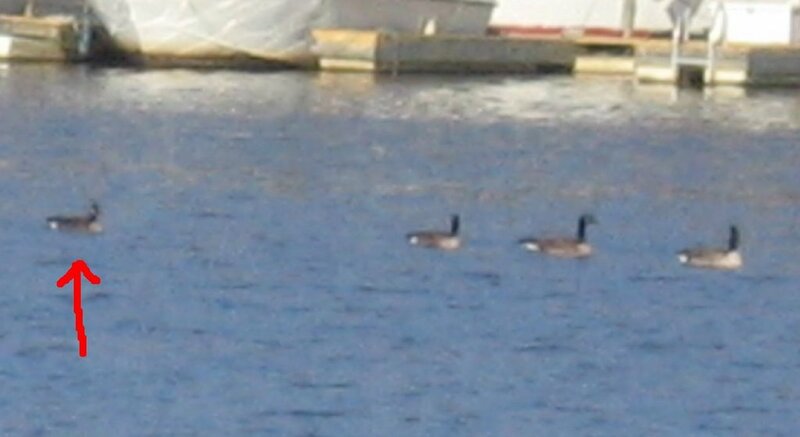 With them was a single American coot and a small flock of buffleheads. The other individual must have come from here. While there were not many species to be seen here, I did get some close-up shots of mallards, and some dramatic images of the sky. 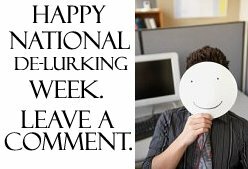 Apparently this week has been branded National De-lurking Week. (Via nuthatch, coturnix.) We all know that the number of people who read a blog is usually far greater than the number who comment. This week exists to encourage readers who rarely comment to do so. Now I am picking this one up fairly late in the game, but I will offer the challenge anyway. If you have not commented before (or only rarely) say a little about yourself* in the comments. What brought you here, or what brings you back? Is there anything you like or dislike about A DC Birding Blog? Do you like certain types of posts more than others? Leave a (non-spam) link if you feel so inclined. Following up on a Post story I linked yesterday, here is a related cartoon by Tom Toles. This afternoon I took the Metro over to the National Zoo to see what kind of waterfowl was hanging around in the ponds and stream. 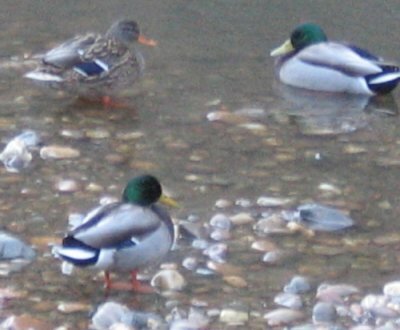 As it turned out, the ponds at the bird house were nearly deserted, with only seven mallards staying there. Not a single wood duck or black duck was to be seen up there. So I walked on down to Rock Creek. As I reached the stream there was a burst of activity above my head. Robin after robin flew from one tree to the next. It appeared that a very large flock was moving down the path ahead of me. Mixed in with this crowd were a few ruby-crowned kinglets, downy woodpeckers, and cardinals. 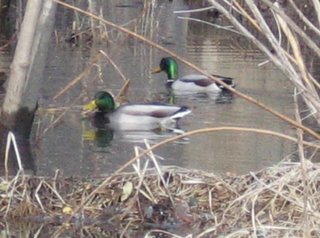 There were plenty of mallards and wood ducks in the stream, but the numbers were still far below what I am used to at the zoo. (I think that the prolonged warm spells must be keeping them somewhere else.) 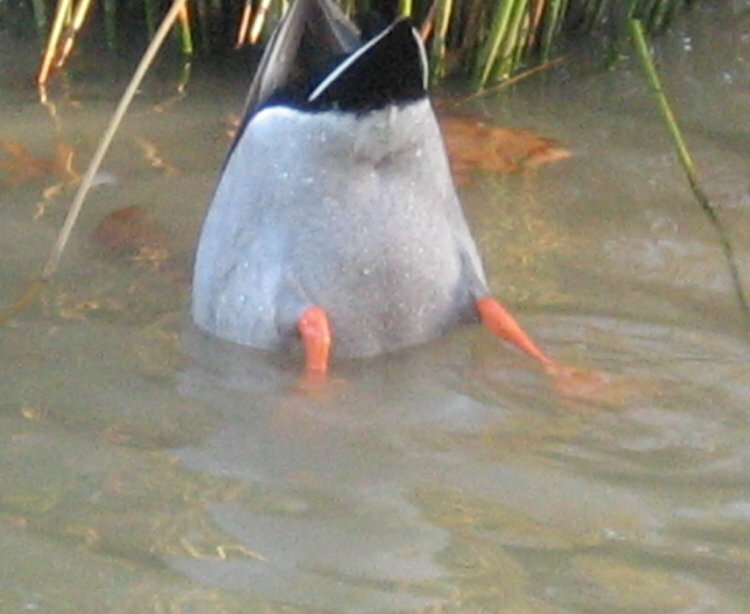 I tried taking photographs of the ducks but with limited success. The mallard shots turned out a little better than the wood ducks. 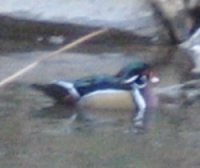 For some reason the camera had a hard time focus on the wood ducks. Whether this was because they are smaller or because they blend in against the bank better, I do not know. (To the right is the best of my wood duck shots from this afternoon.) I love watching wood ducks because their feathers have a silky sheen to them - more so than other birds of their family. Wood ducks are also one of the more exotic-looking birds in this region. Their appearance makes it unsurprising that they are more closely related to Asian mandarin ducks than to other waterfowl in North America. 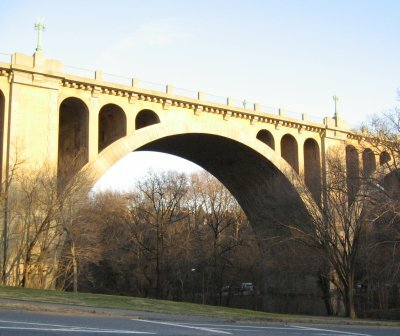 The path along the creek exits the zoo at Rock Creek Parkway and then follows the creek under two major bridges, the Duke Ellington Bridge (Calvert Street) and the Taft Bridge (Connecticut Avenue). Below is a picture of the latter. Nova's ScienceNOW aired a segment about the ivory-billed woodpecker on Tuesday night. The video can be seen here. The show did not cover any new ground, but featured video and audio recordings from the swamp, plus interviews with John Fitzpatrick, David Luneau, and Jerome Jackson. A mutation has been detected in poultry flu samples from Turkey that may make it easier for the virus to penetrate cells in human respiratory systems. While this is a cause for concern, there is still no evidence that the virus is being passed from one human to another. (It is also important to note that the main vector for the spread of the disease remains domestic poultry and not migratory wild birds.) More information about avian influenza can be found at the CLO website. Global warming has been linked to the extinction of many tropical frog species. Amphibians are particularly vulnerable to changes in climate and provide a warning of what may happen on a larger scale if current trends are not checked. 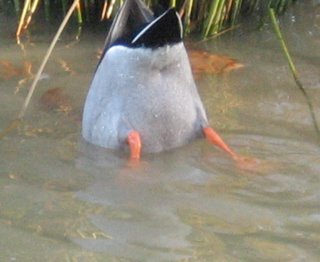 Meanwhile, warming may reduce the waterfowl population in North America by drying up the ponds on their traditional breeding grounds. A Christmas Bird Count in western North Carolina found a yellow-headed blackbird among its 77 species for the day. The Golden CBC in western Canada counted over 900 Bohemian waxwings. Birders in Mississippi are worried about the effects of the many Gulf Coast hurricanes on the local populations of shore-nesting birds, especially least terns and pelicans. The worst damage to nesting colonies was done by Tropical Storm Cindy, not Hurricane Katrina. The Royal Society for the Protection of Birds is hosting its annual Big Garden Birdwatch on the last weekend of January. Participants are asked to watch their garden or local park for an hour and make note of the birds. See here for resources on the ivory-billed woodpeckers, including travel information and opportunities for birders in the Big Woods. There is plenty to see in the area aside from the ivory-billed woodpeckers. This article cites 18 sightings of the ivory-billed woodpecker since its rediscovery. For the first time ever, one of my posts (Sunday Riverfront Birding) has been included in the Carnival of the Vanities. The next I and the Bird will be hosted at SNAIL'S TALES on Thursday, January 19; posts should be submitted by January 17. The Washington Water and Sewer Authority has announced that their testing indicates that the drinking water in the district is largely lead-free. WASA was at the center of a local scandal after it was revealed in 2004 that lead levels in many Washington homes were excessively high, and that the agency had hidden this from the public. Apparently a chemical that WASA added to the water was causing old leaden pipes to leech lead. The agency's solution has been to replace lead pipes with copper ones, and to change the chemical compounds in the water. So far this seems to be working, which is a relief to those of us who live in older structures. The Chesapeake and Ohio Canal runs parallel to the Potomac River for 184.5 miles from Georgetown in Washington, DC, to Cumberland in Maryland. 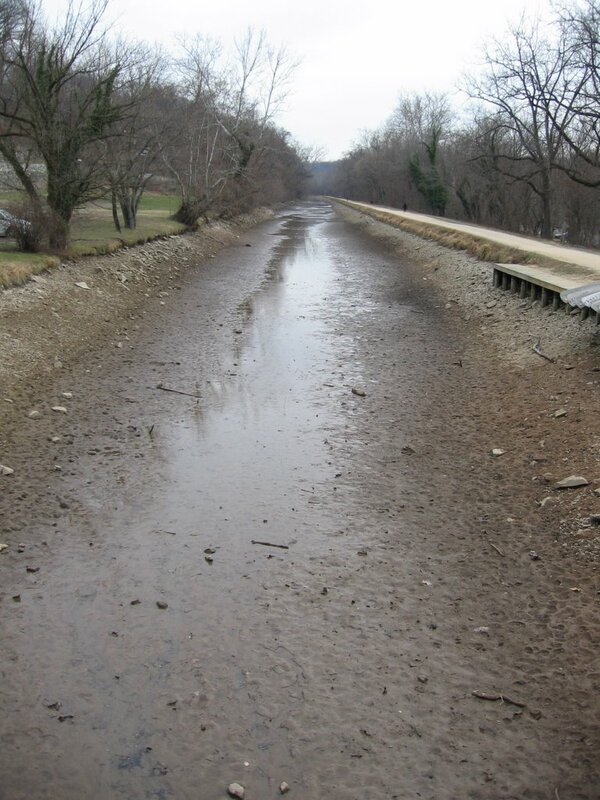 The canal was originally conceived as a major transportation artery between the ports of Washington and Baltimore on the Atlantic coast and the northwest hinterland in the Appalachians and beyond. Unfortunately the construction of the canal was beset by delays, and it was obsolete before it was completed. The Baltimore and Ohio Railroad connected the start and end points of the canal sooner than the canal did. 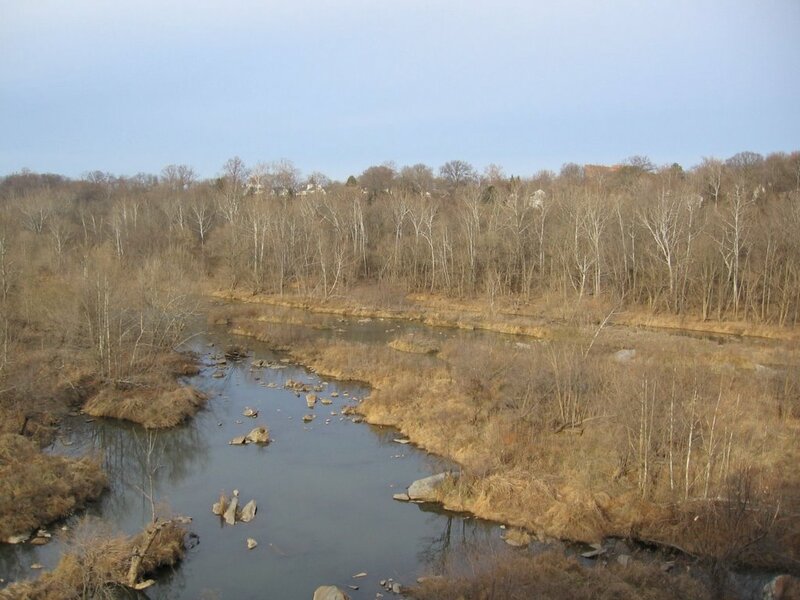 Other canals such as the Delaware and Raritan in New Jersey and the Erie in New York managed to be successful transportation systems despite competition from the railroads, but the C&O never really took off. 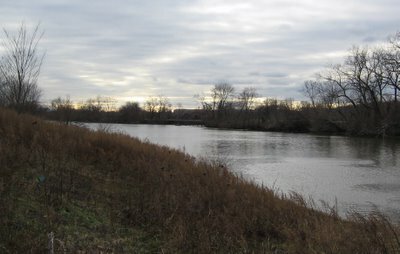 Fourteen years after the canal ceased operations in 1924, it was purchased by the federal government as a recreation area. In the 1950s, with the restoration project still dormant, the government proposed filling the canal and turning it into a scenic highway. This project never came to fruition, thanks in part to the efforts of Justice William O. Douglas, who led a hike along the length of the canal to publicize its natural beauty. 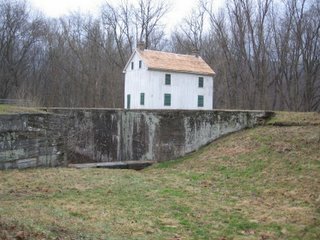 Instead the canal was transferred to the National Park Service. 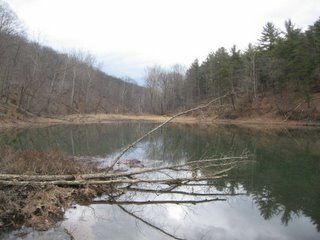 It is now used for various forms of recreation: hiking, biking, canoeing, fishing - and birding. 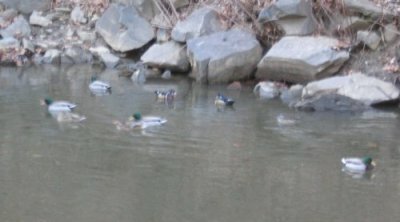 Since 1999, the D.C. Audubon Society has sponsored a midwinter count along the length of the C&O Canal. The goals of the count are twofold. First, it seeks to establish what birds are using the national park, which could be valuable in management decisions. 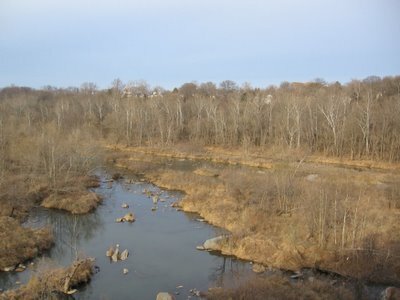 Second, because the canal crosses several geographic regions, it provides a cross-section of the bird population in Maryland in the depths of winter. 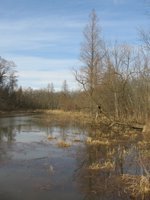 An added benefit is that the canal cuts through some areas of Maryland that presently do not have CBCs, so there is at least partial coverage of the winter population in those areas. Past results from the survey - both numbers and analysis - may be found here. Many of the miles are already claimed, but gaps remain. Anyone who is interested in participating should see here for further information. Counters of all levels of experience are welcome; the more eyes the better. As with Christmas Bird Counts, less experienced participants will be teamed with experienced sector leaders. Early this morning, A DC Birding Blog had its 5,000th visit, from someone in Australia. The hits coming from overseas always surprise me, because my blog is very local in its content. One neat thing about Sitemeter is that it gives charts and graphs about incoming traffic. 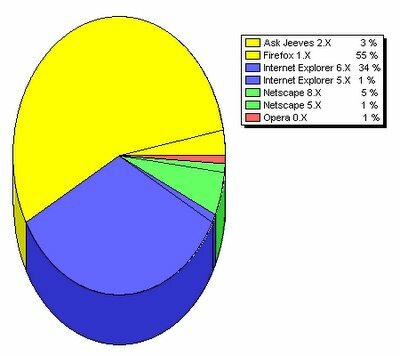 For example, it reports that 55% of hits are from people who use Firefox. Now, I use Firefox, so this sample is probably skewed somewhat. But it indicates to me that bloggers (and blog readers) have a strong preference for the upstart browser over the mainstream one. A collection of news and links on birds, birding, and the environment. During the years of the Bush administration, states have been forced to take the lead on environmental reforms while administration blocks national legislation. One state that is taking up the challenge is Minnesota, where Governor Tim Pawlenty has proposed legislation to clean waterways and a referendum to dedicate a fixed percentage of the state revenue for natural resources. A Christmas Bird Count in Green Bay, Wisconsin, is reporting its second-highest species count in the last thirteen years. A couple in Wisconsin reports that a male ruffed grouse has a strange fascination with their ATV, to the point of following it around. 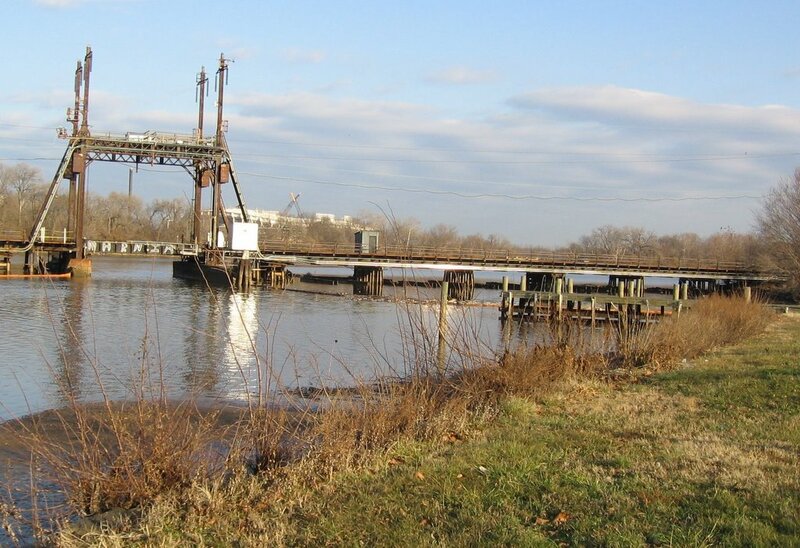 Blog Arundel reports on violations of land-use rules on the Chesapeake waterfront near Annapolis. Birders continue to visit the Conowingo Dam, despite restricted access. (Thanks, Philip.) 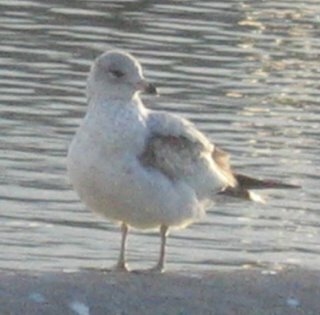 Dams and reservoirs are, in fact, great places for birdwatching, especially for finding interesting gulls and waterbirds. Congressman Richard Pombo, who wanted to sell Roosevelt Island to developers, can expect opposition in both the Republican primary and the general election. With a good challenger, there is hope that this term will be Pombo's last. Thanks to Modulator I learned about a Firefox extension called Performancing, which is a blogging application. I like the user interface overall, and I like the fact that I can write a long post without Blogger losing it before it's published. The downside is that it appears not to have an easy way to upload images, so I still need to do this through the Blogger editor. It is very useful for writing these linkage posts. I backdated both posts to midnight on January 1 so that they would not gum up the main page. Both are long because they contain more or less the full species list for the District of Columbia in tabular form. Both are linked from the sidebar, in their own box right under the "About Me" box. By the way, creating and formatting a table in Blogger is a real pain. Unfortunately this blog software does not have a table function, so they must be coded (at least in part) by hand. The other nasty surprise is that there will be a large amount of white space unless you delete every line break in your table code, leaving code that is virtually unreadable. I can see now why some serious bloggers become eager to find better blogging software. Many birders do not keep track of what they have seen, and some even look down upon listing, especially competitive listing or "twitching." I, however, do keep a life list and lists for various localities. Here are the numbers from 2005. I saw fewer species in DC in 2005 than I did in 2004, when I saw 172. However, I did add six new species to my DC list: snow goose, willow flycatcher, yellow-breasted chat, barred owl, bay-breasted warbler, and northern harrier. It is no surprise to see the arboretum at the top of this list, since it is my bread-and-butter birding location. Out-of-state locations move up the list quickly because one or two trips there at the right times can yield high species counts, while the local spots require a bit more diligence and regular visitation. Since I had some free time at the beginning of this month, I resolved to get my birding for this year off to a fast start by hitting as many of DC's better birding spots as possible. I started somewhat slowly with a trip to the zoo on Wednesday, and then the birding built momentum from there. 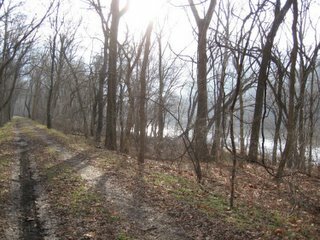 This weekend ends with only a few places - Rock Creek Park, McMillan Reservoir, and the southwest riverfront - left unvisited. As a result, I am already ahead of my 2004 pace, which was my best birding year so far. This morning I visited Anacostia Park in southeast Washington. This quiet park tends to be good for waterbirds, and occasionally some landbirds that prefer open areas. This morning I did have some good waterbirds here. There was a handful of ruddy ducks across from the Commodore Barry; farther down, a pied-billed grebe swam in the river. All the common local gulls were represented, as well as an adult lesser black-backed gull. I also saw my first ruby-crowned kinglet of the year all the way down near the South Capitol bridge. I did leave with a question, and that is whether or not I saw a cackling goose. Several cackling geese have been reported in DC so far this winter, but today was the first time I had seen a real candidate for that species. Cackling goose is a composite of several subspecies that used to be considered part of the Canada goose species until the species was split in two last year. Cackling geese look very similar to Canada geese, except that they are smaller, have proportionately shorter necks, and have stubbier bills. The subspecies most likely to be found in the eastern United States, Richardson's cackling goose, is grayer overall, with breast color matching the color of the flanks. One goose among a flock in the Anacostia River matched this description, though the viewing range was a bit too far for my judgment to be conclusive. I took some photographs of this bird; the best of the lot are shown below. After lunch, I decided to visit the waterways on the other side of town, namely the Georgetown Reservoir and the neighboring C&O canal. The reservoir sometimes has good numbers of waterfowl in winter; today it was mostly deserted except for the gulls. There were some lesser scaup and at least one canvasback all the way on the far side of the water. 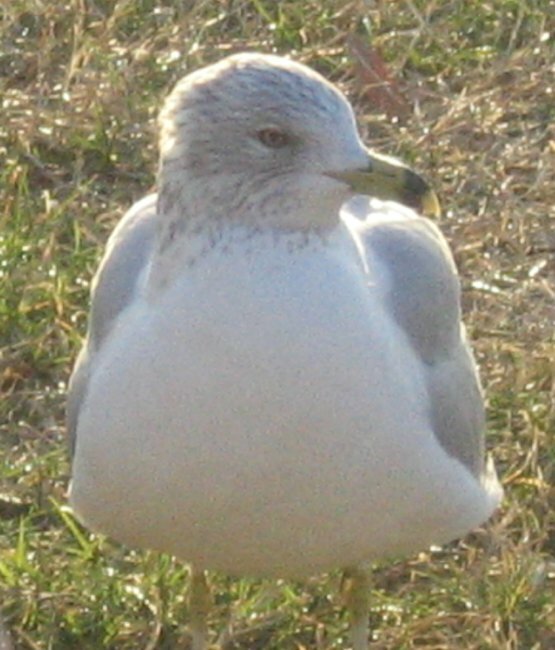 One adult lesser black-backed gull was among the common gulls on the dike. Down at Fletcher's boathouse I followed a foottrail leading west along the river instead of the towpath. This trail soon degraded into little more than a deer path, and even that was sketchy at times. 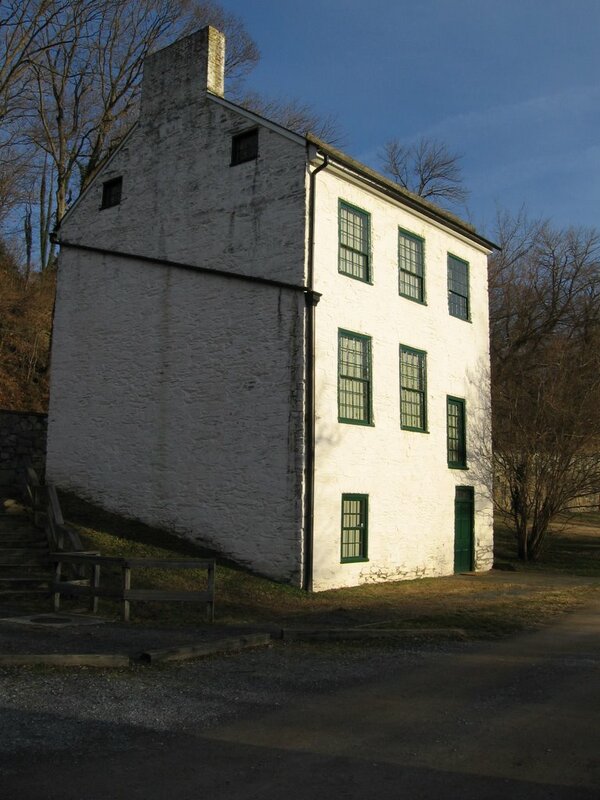 Still I pressed on with that route, since I knew I would not get lost; I was in an area bounded by the Potomac and canal, and Fletcher's boathouse and the Chain Bridge. As long as I kept on in the same direction there would eventually be a way out. The bushwhacking paid off, as I passed through some very birdy meadows. One spot had a female common yellowthroat, which perched on a tree branch at eye level and then glided down into the grass; it showed its yellow underside on the way down. Farther on, close to the Chain Bridge, there was a spot full of sparrows. These included field and savannah sparrows, in addition to the more common ones. Other birds seen along the way included eastern bluebird, belted kingfisher, and red-shouldered hawk. The deer paths, of course, also had deer, which fled before my footsteps. When I reached the Chain Bridge I went up on the walkway to look at the ponds. These held mostly mallards, but also a hooded merganser and several common mergansers. The view from the Chain Bridge was a lovely way to end a long day of birding. 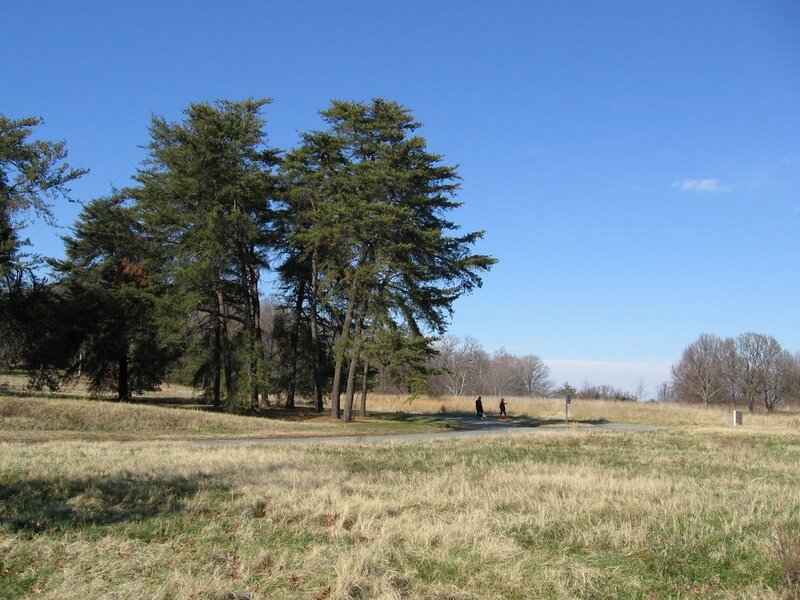 This morning I returned to the National Arboretum for the first time in 2006. While still cold, today was much sunnier than yesterday, with only a few puffy clouds. One other birding group (probably from a local club) was working the Asian collection. Since I decided to bypass where they were, I did not walk the river trail, but that gave me time to cover some other areas. Heart Pond produced little, but as I walked up the road I found a small flock of cedar waxwings and a few house finches in the crab apple trees. Unfortunately the angle of the sun made it difficult to see and identify birds. When I later checked this grove from the other side (where the sun did not interfere), I found a few purple finches mixed in with the house finches. During the winter months purple finches are pretty reliable here in the fruit tree groves. I scanned both river overlooks, but found nothing to see on the river. The pines on Hickey Hill also produced little of interest. So I moved on down the road. Usually the hemlocks bordering the golf course have some goldfinch and junco action, but today they were quiet. The bushes around the gate were also deserted, or so it seemed. The reason for the silence became clear when a sharp-shinned hawk cruised past. My last stop was the wood behind the state tree picnic grove. There were not as many blue jays and robins here as in some other parts of the arboretum, so it was easier to find the smaller birds. A faint honking sound announced the presence of a red-breasted nuthatch. I got a good look at it after it flew into one of the scrub pines. As I turned to leave the spot, a brownish bird flew up to a perch above my head - hermit thrush. Both red-breasted nuthatch and hermit thrush had been seen in this area during the Christmas bird count. On the way back to the bus stop I had another sighting of a sharp-shinned hawk, and, further along, an adult chipping sparrow. While I was waiting for the bus, a Carolina wren postured on the other side of the road. My series of links about birds, birding, and the environment returns after a several-week hiatus. Overfishing has hastened the decline of the marbled murrelet and other seabirds on the west coast. Sardine fishing seems to be a particular culprit. Recapture of banded birds is showing that birds can live much longer in the wild than previously believed. One Manx shearwater is known to be at least 55 years old. Oystercatchers and razorbills have been found to live into their late thirties. A woman sued Lowe's after being attacked by a bird, but the suit was dismissed. No indication of the species, unfortunately. A Minnesotan writer describes the pecking order at an urban birdfeeder. Virginia is considering legislation for a moratorium on horseshoe crab importation. See the link for how to help. DC Metro Action notes that small grants are available for community gardening projects in Washington. This week's Birds in the News includes a round-up of CBC reports. Visit the Friday Ark #68. When I arrived at Kenilworth Aquatic Gardens this morning, I was greeted by a chorus of crows. Both species were represented - fish and American. Both did their best to make the gardens a noisy place. I think the crows even set the other birds on edge, because the Canada geese in one pond took off when a nearby American bittern made its pumping call. The raucous crows fit the gloomy mood of the day, which was overcast and cold. The sun tried to break through around noon, but soon was pushed back by the blanket of clouds. While looking for the bittern, I came across an American tree sparrow. 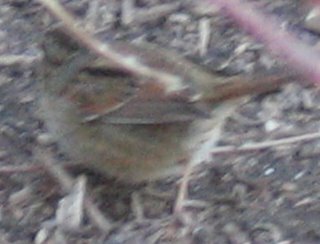 This lovely little bird with the rufous cap is fairly unusual for DC, even if it is more common further north. Today, in fact, turned out to be a good day for sparrows. 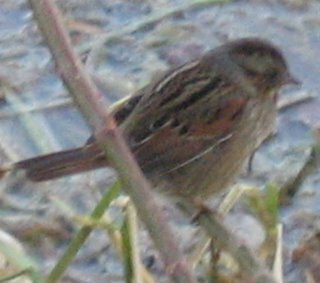 In addition to the tree sparrow, there were several fox sparrows along the boardwalk, and swamp sparrows on the river trail. The marsh at the end of the boardwalk held American black ducks and common mergansers, as well as a few killdeer. A large flock of red-winged blackbirds passed overhead and settled on the far side of the channel. At this point I began to feel very cold and realized I ought to have dressed more warmly. Still, I pressed on for the river trail. As I made my way back through the ponds, I found a yellow-bellied sapsucker (pictured above). 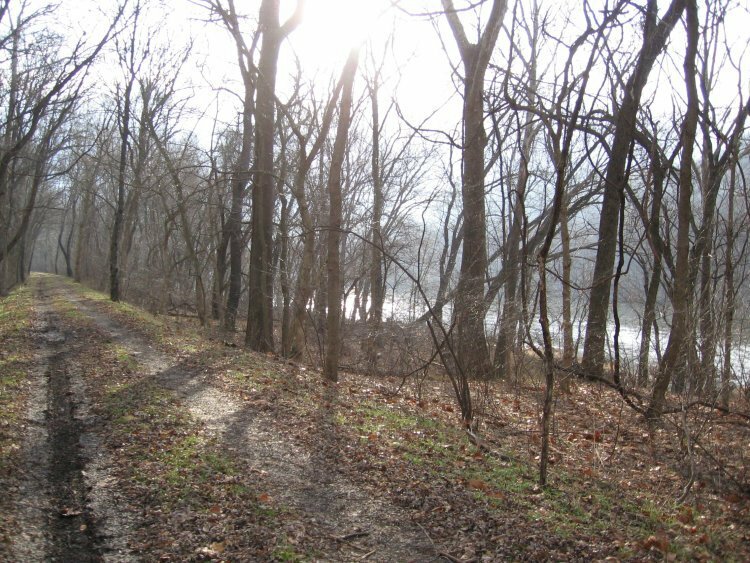 The river trail held several flocks of sparrows and woodpeckers. There was also one flock of tufted titmice and Carolina chickadees that held several chickadees that almost looked like black-cappeds, but were not quite convincing enough. As I walked further along, a brown thrasher disappeared into the brush on the right side of the path. At the very end of the river trail were three eastern bluebirds and a few yellow-rumped warblers. On the way back, I found a gray catbird eating poison ivy berries. That made it a three-mimid day, which is very good for January. After finishing up at the aquatic gardens, I headed over to the neighboring Kenilworth Park to look around. The only bird I saw there that I had not seen at the aquatic gardens was a peregrine falcon. There were a few sparrows in the no-mow areas, but I could not get a good look at any of them. This picture of the Anacostia was taken from Kenilworth Park in the early afternoon. Early this afternoon I visited Roosevelt Island for a bird walk around the marsh and wooded swamp. On a good day in winter one can observe all six local species of woodpeckers. Today was such a good day, as pileated woodpecker, yellow-bellied sapsucker, and hairy woodpecker made appearances alongside the more commonly seen red-bellied woodpecker, downy woodpecker, and northern flicker. Early on, I turned up a couple brown creepers among the ivy tangles on the western trail. When I reached the marsh (pictured at right), several house finches and some feisty Carolina wrens were there to meet me. One red-winged blackbird - unusual for January in DC - was at the bridge, and a small flock of them was foraging on the other end of the marsh. Water levels in the marsh and woods were quite high today, thanks to the recent rains. Mallards (pictured below) made the most of the extra water. Near the northern end of the boardwalk there was another burst of avian activity. It started with the appearance of a yellow-bellied sapsucker, which mewed vociferously. (Yes, this woodpecker does sound a bit like a cat.) Soon the trail was full of sparrows, including a few swamp sparrows. More brown creepers appeared, along with some white-breasted nuthatches. One first-winter eastern phoebe perched on a low branch close to the water. This bird must have come north in the last week or so as insects would have been scarce during the last two weeks of December. Finally, a winter wren popped up from under a branch pile and perched on a fallen log; it stayed up long enough for me to get a good look at its delicately streaked plumage. A little later it sang a short bit of its song, one of my favorite bird songs. The many fallen logs and overall damp conditions make Roosevelt Island an excellent spot to observe fungi, as well as birds and animals. One example is at right.